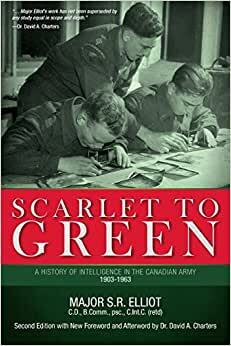 Scarlet to Green details the 'boom and bust' cycles of the Canadian Army's intelligence organization from its inception in 1903 to 1963, the eve of the Integration of the Canadian Armed Forces. The book analyzes the role of intelligence in Canadian Army operations in World Wars I and II, and the Korean War, as well as its activities in Canada. The influence of intelligence on operational decision-making, the development of new intelligence collection techniques, and the challenges of countering enemy espionage and subversion are some of the enduring aspects of military intelligence explored. Elliot draws particular attention to the imperatives for having a highly capable and professional military intelligence organization and staff, and shows the challenges when the situation is otherwise, in both peace and war. Start reading Scarlet to Green on your Kindle in under a minute.